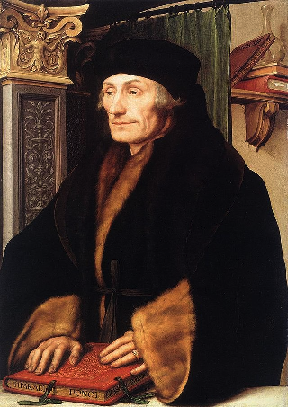 Erasmus, the Dutch Renaissance humanist, priest, social critic, teacher and theologian. He chose to stay with the Roman Catholic Church. For centuries some had called for a return to the greater simplicity of earlier Christianity and specifically for a return to the laity having more influence within the Church. And there were calls for appointments to the higher clergy based on wisdom and morality rather than class and wealth. Christians were concerned about the low standard of ordination into the priesthood. They found fault with priests drinking, gambling and living with concubines. And some complained about priests and monks being exempt from taxation and civil responsibilities. Discontent within the Church had turned much of Christendom into an arena of debate, and much of the debate was bitter and full of name calling. 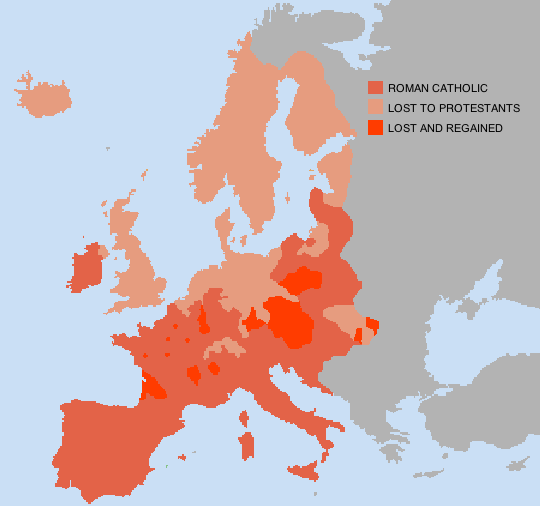 Many of Europe's Christians had begun thinking of themselves as belonging to a nation, and among intellectuals secular languages were replacing the use of Latin. This was a challenge to the influence of the Roman Catholic Church, which was sticking with Latin. Germany was an area of intellectual unrest. 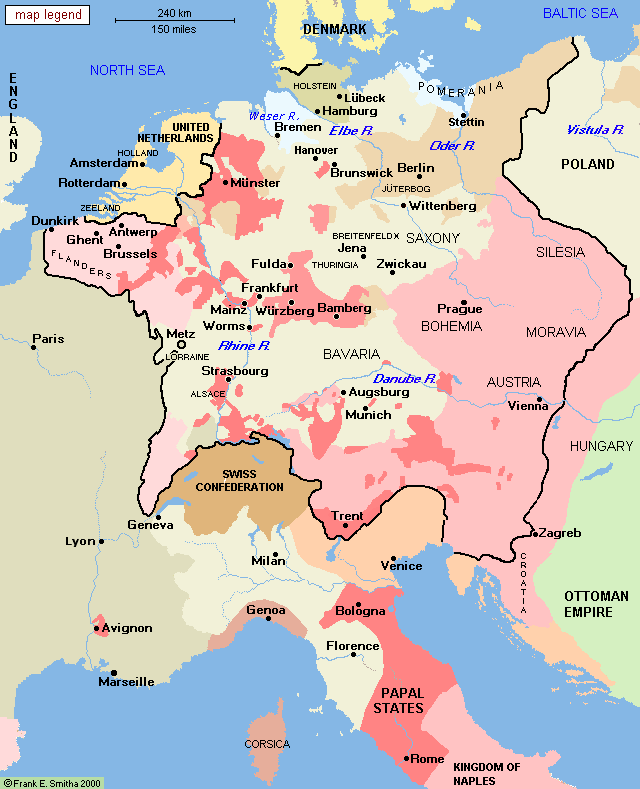 It was divided into hundreds of states ruled by a prince within the Holy Roman Empire. One of the Holy Roman Empire's more powerful elector-princes was Frederick of Saxony, who forbade the sale of indulgences within his realm. Indulgences involved payment in coin to a priest for the purpose of relief from guilt of sins, release from purgatory and assurance of a place in heaven. And defying Frederick, many people were crossing Saxony's border into Jüterbog or Thuringia to buy these indulgences. Another who disliked indulgences was an Augustinian friar and professor of theology at a university founded by Frederick of Saxony, in the town of Wittenberg. This was Martin Luther, who disliked seeing poor Germans giving up scarce coins that would go to Rome. He was tormented by whether he was worthy of salvation, and he found assurance in the Bible in the idea of forgiveness of sins: that God forgave individuals by their faith in the sacrifice of Jesus Christ. Luther found in scripture no support for indulgences, and he believed that indulgences were of no value to a sinner. He worried over his questioning of the Church, asking himself whether he alone was so wise and whether centuries of Church policy could be wrong. But he answered his own question, concluding that authority lay in the Bible. In 1517 a priest arrived in Wittenberg selling indulgences for the sake of raising money for Pope Leo X (1513-21) and the construction at the Vatican. Luther's response was to write a letter, sent at the end of October to Germany's most powerful churchmen, the twenty-seven year-old Archbishop of Mainz, Albrecht of Hohenzollern. The letter was received on November 17 – the speed of mail in those times. The letter was respectful, asking the "Lord God to guard and guide" the Archbishop, and without sarcasm Luther described himself as "the scum of the earth." He asked the Archbishop to look at the propositions he had enclosed – the 95 theses that Luther is rumored to have also nailed to the door of the Wittenberg church – propositions that included Luther's opposition to indulgences. The Archbishop responded to Luther's propositions by writing a letter to Pope Leo X. Much letter writing followed as Luther's propositions stirred debate. Some complained that to deny the legality of indulgences was to deny the authority of the pope who had authorized them. Luther acknowledged this, saying that the pope had no such authority. The Church demanded that Luther retract a number of his protests. And rather than retract, Luther described the Church as its people. He announced that he was bound by Holy Scripture alone and that it was neither safe nor right for him to go against his conscience. Luther had in his favor things that dissidents in previous centuries had lacked: the printing press and a rise in literacy. Printing in Europe was by now around seventy-five years old. It had been a manufacture largely of ecclesiastical books in Latin, which gave a few their own Bible to read from, weakening dependence on the pronouncements of Church clergy. And printing for Luther was now to allow Luther to create pamphlets explaining his positions. Luther's pamphlets were only a few pages, quickly printed for little money, and they cost little to buy. From the year 1518 to 1520, many copies of thirty of Luther's different appeals were printed. Luther's message went viral, while those wishing to counter Luther's opinions had difficulty getting published, publishers having little interest in producing pamphlets for which there was little demand. On June 15, 1520, the papacy ordered Luther's works burned, and the papacy gave Luther sixty days to recant to prevent his being excommunicated. After the sixty days passed, Luther was ordered to appear before representatives of the Pope and before the Holy Roman Emperor, Charles V, also king of Spain, his subject Hernán Cortés at the time busy conquering Mexico. The meeting was scheduled for April, 1521 at Worms, from Wittenberg about 250 miles (400 km) southwest across German lands to the Rhine River. That year, as Luther passed through towns on his way to his appointment, jubilant crowds turned out to see him. At the meeting, Luther was accused of heresy, and Luther announced that he could not and would not recant anything, "for it is neither safe nor right," he said, "to go against conscience. God help me. Amen." Luther's statement rang across Europe. Luther was declared a heretic. Luther went into hiding in one of Frederick's castles, and the Church declared Luther an outlaw. While in hiding, Luther began translating the New Testament from Latin into German, to make the Bible available to more people. Its first printing was in 1522. Luther was pursuing his belief that people found grace through faith and study rather than through sacraments performed by priests. God, he held, was gracious rather than vindictive. Luther was appealing more to individualism than the community of faith practiced by the Church, and he appealed to the empire's individualistic-minded middle class, the urban bourgeoisie, who preferred his appeal to intelligence rather than to childlike obedience. 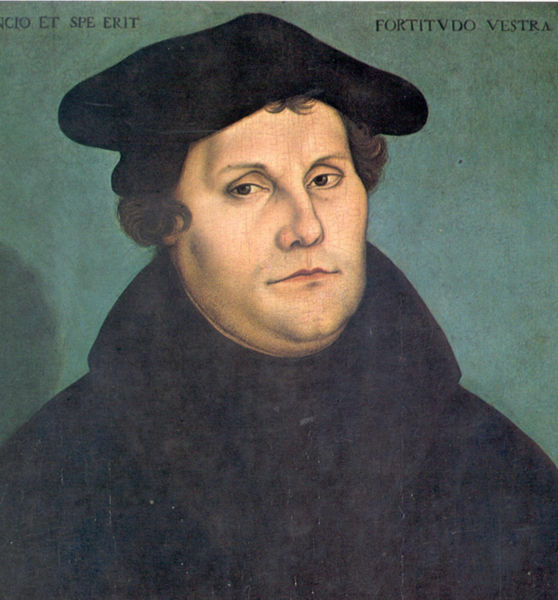 The bourgeoisie found Luther's belief in an individual's direct access to God attractive. They shared Luther's indignation at the sight of Italian clerics taking money from people of their nationality. The bourgeoisie shared Luther's brand of discipline as opposed to the tradition of saintliness through poverty. And, with the help of these dissidents, Protestantism spread, while the Church maintained its internationalism and loyalty of hold on the landed wealthy – the owners of estates. Christians with a variety of views were flocking to Luther's banner. There were those who found no support for infant baptism in scripture and supported baptism only for believers. They were derisively called Anabaptists. Some of them espoused egalitarianism and other revolutionist doctrines, and they found followers mainly among the poor. Luther didn't recognize humanity's inclination to diverse opinion, and he was unhappy about it appearing among his fellow Protestants. He was no defender of choice in religious conviction. He believed that God had spoken clearly and that no excuse existed for deviation. Truth for Luther was absolute and people who strayed from that truth were in error. Among Protestants few were defending freedom of choice in religious conviction. Tolerance regarding religious ideas was not yet in fashion. Each dissenting group considered their dissent correct and differing dissents as straying from the Truth. Those who were to be called Lutherans held in common a belief in abolishing the Roman Catholic tradition of confession, an abolition that appealed to women wishing freedom from embarrassing observations about their sexual lives. In Lutheran schools, boys and girls became literate in the catechism and the Bible. The Lutherans abolished monasticism and emphasized the home as a special domain of the wife and a place of love, tenderness and reconciliation. The Lutherans allowed their clergy to marry, making it possible for those women who had been the concubines or mistresses of priests to become honorable wives. In 1525, around the age of forty-three, Luther married a former nun, Katharina von Bora, and he was to father six children. Arguments between the Lutherans and loyal sons of the Catholic Church continued. In keeping with the custom of debate in those times, spokesmen for the Church hurled vulgar epithets at Luther and his followers and Luther hurled epithets back. The Catholic intellectual Erasmus was an exception and limited himself to tempered observations. He saw Lutherans yielding no less to luxury, lust and greed than did Catholics, and he disliked the fanaticism that he saw in Lutheran evangelists. Erasmus disliked some Catholics, but he said that "one bears more easily the evils to which one is accustomed" and that therefore he would stay within the Church.